From storage, the maize is cleaned in a high capacity cleaner, and after moistening it is degerminated. 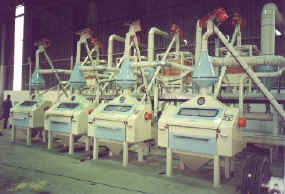 The turbo sifter separates the high oil content grit/meal admixture.. The product is then processed through the milling and sifting system which entails five Roller mills and six high capacity Mini Sifters. The four products (bran, sifted, special and super maize meal) are bagged-off directly from the conveyors in 12.5 kg to 80 kg bags. 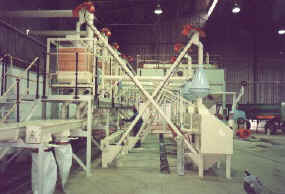 The micromill is a new concept in medium capacity maize milling. It offers the features and products of normal milling operation with the flexibility and easy management of a small unit. 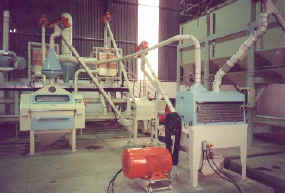 The mill is fully automated by means of a PLC. This operation is simple and reduces start-up and shut-down time to absolute minimum. The PLC has a manual override if necessary. The micromill can be installed in an existing warehouse or shed. No extra civil or structural work is normally required. The approximate floor area required is 25 meters X 10 meters. Installation and erection times are dramatically reduced, resulting in a large cost saving. Due to the high quality and sturdy made roller mill stands, the miller can be ensured of a consistently high quality product, reliability and low maintenance operation.